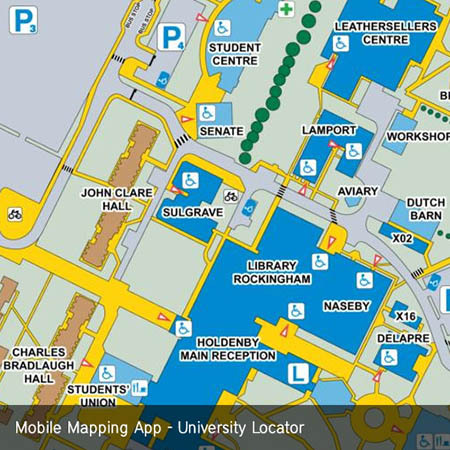 Whether it’s for a specific event like an Open Day or understanding parking, or even handling delivery drops and collection points, a university or college campus map is invaluable. 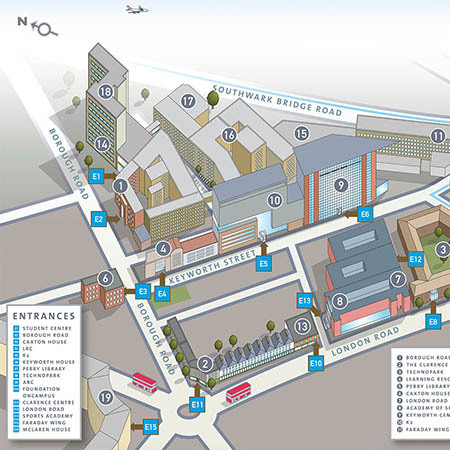 It is therefore equally important that any map design process takes into account the unique needs of several groups of visitors and other stakeholders who need to navigate around a site safely and efficiently. Here are a few factors that we feel are vital to consider, when dealing with campus maps. It’s important to consider those visitors that may have visual impairments, colour blindness, those viewing the map in low light or any other accessibility related issues. For instance, do height differences need to be visually indicated, or where steps or wheelchair access might be located, along with accessible entrances? Another useful addition to a campus map is incorporating illustrated or 3D buildings that can assist with orientation and way-finding. Specific illustrated buildings and Points of Interest adds a layer of personality to a campus map and aids visitors in engaging with it. Good cartographic design will use colour to differentiate between different campuses or facilities within a single site, for instance, clearly marking Halls of Residence from Teaching buildings or Recreation Halls. A clear labelling effort for these specific location on either the map itself or marked with a number referenced with a key would be very helpful. Getting the appropriate display size agreed from the outset of any mapping project is vital. 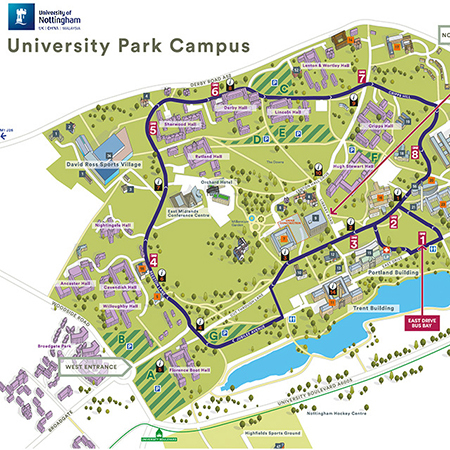 If a map is to be displayed on a board within a campus but also needs to be dropped down to size on a small leaflet, the amount of detail would need to be considered, to make sure it’s legible. The need to have a map that works at different sizes can be overcome by having different layers of detail that one can switch off or on, to suit varying scales. Be insightful and identify areas of a map that can be minimised or eliminated. For example, if pedestrians and cyclists are meant to use the map, the information it holds could be less relevant to delivery drivers. The ideal scenario is to strive for a single map resource that’s capable of being repurposed for several groups. Every College or University wants to be involved in a map-making process, whether they know it at the beginning of a project or not. A campus map is after all, a way to reinforce an identity. Whether it’s keeping an eye on corporate styles, branding, colours or logo design, it’s important to involve them at an early stage. A working group can be set up at the beginning of the mapping process, where constant progress is monitored and feedback invited from everyone present. As with any visual medium, there’s a high likelihood that these working groups will begin to collect feedback on a number of topics. Identify which of these are genuine concerns that need to be dealt with, and either eliminate or de-prioritise others that do not entirely fit within the scope of the project. Involving the client at every stage in this process will ensure a smooth workflow across your map-making project. Once the general brief of a campus map has been fulfilled, it’s important to sometimes take a few steps back from the canvas, (or campus in this case), and consider what additions would really make it more effective. For instance, as campus maps tend to cover a relatively small geography, perhaps including local transport links that connect to the site, local town centres or village routes, rail stations and supermarkets would add that little extra bit of nuance to a map. If budgets permit, a college or university could also benefit from an interactive version of their campus map, or a mobile app that prospective students could use to investigate and navigate the site with ease and comfort.